Is Offshore Coding Dead in the Water? A study sought to find out whether sending coding off these shores was a worthwhile investment. In September 2018, Bill Wagner, CHPS, chief operations officer and cofounder of KIWI-TEK, showed up to the AHIMA Convention in Miami armed with a new study. His presentation, "Is Offshore Coding Really Saving You Money?," offered a fresh and data-driven perspective on an ambiguous issue. Wagner, whose company has been providing medical coding solutions since 2002, had discovered offshore coding wasn't the panacea it seemed to be at the beginning of the ICD-10 transition—a discovery that might have gone unrealized if not for a chance conversation in 2017. "I was approached by AHIMA leadership at the national convention in Los Angeles in 2017. They had mentioned they were being challenged to take a position on offshore coding. In order for them to take a position, they were looking for any kind of study or analytics that had been done on offshore coding compared to USA domestic coding," Wagner says. AHIMA needed reliable data in which both offshore and domestic coders were employed for the same client, during the same timeframe, and for the same types of patients. They hoped to see a comparison of productivity, accuracy, denial rates, and training time. "Well, I have all of that," Wagner told them. At the time of that informal conversation, KIWI-TEK had ceased employing offshore coders for about a year, but it had previously had a robust offshore workforce during the ICD-10 onboarding years. Wagner began thinking maybe there was an important story hiding in KIWI-TEK's coder performance reports. Thus began the data mining that would become the study presented a year later in Miami. Even he would be surprised by the story the numbers told. Throughout the course of his analysis, Wagner discovered three things: Offshore coding is more expensive than domestic coding, offshore coding poses HIPAA compliance issues, and there is no coder shortage in the United States. And, he delivered the numbers to support his claims. Following AHIMA's inquiry, Wagner analyzed KIWI-TEK's data over a two-year time period from January 2015 to January 2017 when the company had used both domestic and offshore coders. He was looking for the largest clients who had used a significant number of coders. In the end, six hospital systems were selected for the study. The findings were unequivocal. In an apples-to-apples comparison of KIWI-TEK coders, the offshore coders were less productive and less accurate than the domestic coders. There was a higher denial rate and lower reimbursement resulting from a lower case mix index. Additionally, offshore coders required longer onboarding. In the end, the savings realized from employing lower-wage offshore coders was lost to productivity issues and lower reimbursements. All variables considered, offshore coders cost hospitals $3.10 per hour more than their domestic counterparts. The study is the first of its kind, and the findings are, it seems, the first solid numbers supporting a move away from offshore coding solutions. That, in itself, is interesting. What's also interesting is the timeline of events leading up to the study. This includes KIWI-TEK's abrupt pivot away from their own use of offshore coders in 2016 and the company's willingness to put a stake in the ground against the practice. Discovering the increased expense of offshore coding was the postscript to an argument against offshoring that, for KIWI-TEK, had been a matter of compliance. In fact, it was HIPAA compliance, not cost, that drove KIWI-TEK to halt their offshore agreements in October 2016. In spring 2016, KIWI-TEK had concluded its second security risk assessment in keeping with the Office for Civil Rights' (OCR) move into Phase 2 of its HIPAA Audit Program and the agency's promise to look more closely at covered entities' business associates. "We realized you cannot ensure 100% compliance with all of the HIPAA requirements of a security risk assessment—and especially the new audit controls that the OCR put out in 2016—if you're using offshore," Wagner says. "Upon discovering that, we went to every client that were still using offshore and convinced them to go back to domestic." Notably, the company had not yet conducted the study that would reveal the added expenses of employing offshore coders. 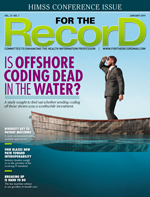 Just a few months earlier in February 2016, Wagner's colleague and KIWI-TEK 's Executive Vice President Jerry Mason wrote an article for Becker's Hospital Review in which he urged a "balanced approach to offshore medical coding," citing the early stigma to offshore coding. Mason focused on the lower costs and on-par reliability of offshore coders, a position in direct opposition to the study his company would publish the next year. While some may find the company's quick move away from offshore coding curious, others may point to nimble leadership and the business's effort to comply with ever-evolving federal regulations. In early 2016, KIWI-TEK had just come out of the ICD-10 frenzy that had threatened to send workflows and productivity down the drain. In response to client demand, KIWI-TEK ramped up offshore resources. The outlook was positive. Mason's article sought balance for an industry that was finding a new equilibrium, just in time for the OCR to tip the balance with its renewed focus on business associate compliance. Much like Wagner, Daniel Utech, RHIA, CHPS, president of the Texas Health Information Management Association, is concerned with the ability of health care organizations to stay compliant when sending coding offshore. "I believe there are still major concerns with how organizations can mitigate the privacy and security risks in a foreign country. Laws are applied differently internationally and can be difficult to enforce when the customer is based in a foreign country," he says. "Security procedures are quite strict for in-house coders with some institutions requiring coders to send pictures of their at-home office annually for compliance. Procedures similar to this may or may not exist for offshore coders—and when they do, they can be hard to audit from abroad." During the lead-up to ICD-10, it appeared as though some health care organizations may have been more willing to send coding offshore as a safety net for lower productivity. However, Utech does not believe that was the case. "At first, I would say yes [they were willing to offshore coding] in that they were concerned with in-house coders being able to meet the productivity and quality expectations with the new code set. However, most coding leaders I know had similar concerns with offshore coding and opted for outsourced coders in the USA," he notes. "Many teams were able to adjust to the new code set quickly, and I have heard there has been a decrease in the need for outsourced coding services." Today, it's difficult to find anyone in HIM willing to make the same argument for offshore coding that was prevalent two years ago. Experts repeat the same refrain: "Offshore coding is hurting Americans and businesses." So says Laura Norrie, vice president of Universal Coding Solutions, along with many others in academia and beyond. Similarly, Wagner recalls a moment from his presentation in Miami when during the Q&A a man in the crowd stood to express his frustration with placing new HIM graduates into jobs. Most employers require three years of experience, he said, while at the same time organizations will outsource coding to a company using offshore coders whose only training has been a short six-week course. In addition, they have not been certified and have no experience. Wagner paraphrases, "He said, 'Using offshore coders is preventing US HIM graduates from getting jobs when they are much, much more qualified.'" This, perhaps, is one of the worries weighing on AHIMA as the organization works toward a formal position. September 2018 is far from the first time Wagner has spoken about KIWI-TEK's findings. Since December 2017, the study has been presented publicly at least six times and a related white paper has been published widely via social media and the company's website. "Wouldn't you think," Wagner says, "if an offshore company could rebut any of [the findings], they would have done it by now? There's no rebuttal." Even more difficult than finding supporters of offshoring is finding accurate numbers on how many hospitals are using offshore services. A February 2018 article in The Boston Globe cites a survey by a "health information professional association" that reported 25 out of 400 hospitals surveyed were offshoring their coding. The numbers are difficult to collect and verify, the article asserts, because employers are none too keen to admit they are using offshore services, especially with growing political skepticism around globalization. Many hospitals are ascribing to a don't ask, don't tell attitude, turning a blind eye to who exactly is doing their coding, leaving the details in the hands of an outsourcing firm. On the other hand, some outsourcing companies are equally vague about where they are getting their coders. In fact, there is no law requiring that they report offshored data. "I know of—just from casual conversations in the past year—probably five or six facilities that said, 'Yes, we're using company XYZ and we strongly suspect they're using offshore coding instead of domestic coding,'" Wagner says. While a prevailing ambiguity clouds the industry's ability to report on how much coding is going overseas, domestic coding firms are willing to share their anecdotal data. "We recently had a company contact us to assist with coding needs due to all of the errors and denials with offshore coders. There is a detrimental disconnect," Norrie says. "We cannot have foreign companies managing our health care—period," she adds. Most would argue there is nothing inherently bad in offshoring data. Respected international companies are not lurking in the shadows waiting to capture protected health information (PHI), but that's a moot point during an OCR audit. Just because a breach would not be reported by a foreign company not bound by HIPAA, it doesn't mean breaches aren't occurring. "No one under HHS [Health and Human Services], not the OIG [Office of Inspector General], the OCR, they're not going to go over there snooping around," Wagner says. That means companies like KIWI-TEK and the covered entities they serve will take the fall for noncompliance. And with new numbers that show the cost on top of the risk, it can be argued that offshore coding simply isn't worth it. "If it's costing people jobs, it's not less expensive, it's a significant drag on the hospital's revenue, and there are issues with protecting PHI, why are we doing this? Somebody give me a good reason for going offshore," Wagner says. Utech says there are instances when offshore coding can make sense. "I believe offshore coding has its place depending on the size of an organization and its financial resources. If the contracting is done well, there should be tools to hold the coding company and its coders accountable," he says. "I think health care providers need to take into consideration all of their internal policies and procedures when working with the vendor on the contract. They also need to take into consideration the country the coders are in and the country where the company is based. Lastly, they should do some research to determine how that foreign country has held other businesses accountable when working offshore from the customer." Judy Sturgeon, CCS, CCDS, CICA, the clinical coding/reimbursement compliance manager at Harris County Hospital District in Houston and a contributing editor at For The Record, has first-hand experience dealing with the coding vendor selection process. In her experience, where the work was being performed is a huge differentiator. "I was involved in the RFP [request for proposal] process here to select from a group of vendors offering services, and whether or not there were offshore entities involved eliminated some otherwise decent contenders," Sturgeon says. "We don't handle our own vendors—that's all handled through county offices rather than by the hospital district itself. While we normally have to consider price comparison seriously since we're the public health and hospital system for the fourth largest city in the country, it was the compliance issue that shut down the 'but we're cheaper' arguments." The inability to keep close tabs on PHI proved to be too much of a hurdle for vendors using offshore coders to overcome. "A company that guaranteed their US-based clients could have strictly US-based vendor employees and US-based vendor servers wasn't good enough to make the grade for the contract. The risk of being unable to control where our PHI could end up—or from where it could be hacked with no likelihood of ever rescuing it—was too much risk," Sturgeon says. "Any vendor that was not totally US-based both physically and digitally was eliminated from consideration." According to Utech, members of the Texas Health Information Management Association have experience with offshore coding. "The biggest lesson learned for them was ensuring the same high level of quality and productivity came from the offshore service as their in-house coders," he says. Those arrangements were carefully constructed, Utech notes. "Similar to contracts with outsourced coding companies with coders in the USA, contracts for offshore coders must contain language that requires the offshore coding company to provide quality data on their staff—not only provide the data but [also] allow the customer to review the details and not merely a summary of the findings. Lastly, the customer should be able to control which coders are allowed to work on their account based on metrics, including quality," he says. Thus far, AHIMA has not taken a formal position on offshore coding—as confirmed by an AHIMA representative—and there may be good reasons for them to avoid doing so. "I haven't gotten any feedback from AHIMA leadership, specifically. I have gotten feedback from the other AHIMA members that [the study] was right on, that there was a need for this, that it was overdue," Wagner says. Utech believes that while offshore coding has its place, it's not to be entered into lightly. "Offshore coding can offer considerable cost savings for many health care providers and organizations. However, many factors must be in the contract and carefully monitored to ensure the offshore coding company and staff are held to the same high standards of privacy, security, quality, and productivity required by certified coders in the USA," he says. Wagner doesn't see any reason to push AHIMA to take a position. "All I'm trying to do is clarify a situation that has been grossly misunderstood for a long time," says Wagner, who admits KIWI-TEK didn't realize what was happening until it started looking at its own data from a different angle. As the dialogue continues, perhaps all that's required is for everyone to look at their own data from a different angle. "Hospitals will start understanding that [sending coding offshore] is only harming them," Norrie says. Utech says HIM professionals must be part of the decision-making process whenever a health care organization is considering offshore coding. "I think the HIM industry is aware of the threats to our industry and our patients from offshore coding. I am not certain though that HIM professionals are consistently consulted before offshore coding decisions are made," he says. "We as HIM professionals must advocate for our profession both outside and within our organizations. We are the subject matter experts who can provide the necessary feedback to ensure the quality of our health information leading to improved health outcomes and revenue integrity." — Sarah Elkins is a West Virginia-based freelance writer.